Ann Peebles, Millie Jackson, Queen Aretha, Betty Wright, Tommie Young, Laura Lee, Candi Staton and Shirley Brown. What did they have in common? They probably honed their superb voices in church. That's one thing for sure. The other is that men have done them wrong, real wrong - I'm telling you. 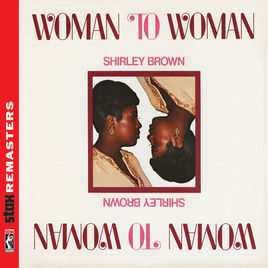 Shirley Brown sings mainly from that same romantically downtrodden yet strong as a redwood tree perspective. The wonderful "It Ain't No Fun" is just such a great example of the genre. It is superb, horn-driven, funky Stax soul of the highest quality, and in true "Shirley style" it has one of those trademark spoken parts. She likes to confront her man and/or her love rival. This is played up to the max on the iconic "Woman To Woman" - "Hello may I speak to Barbara, this is Shirley....", you know the rest. Such a great concept for a soul song. She really had one of the great "lost" soul voices of the mid-seventies. Other highlights are a storming cover of "Stay With Me Baby"; the poppier soul of "Long As You Love Me"; the tender and beautiful "Passion"; the funky, upbeat "I Can't Give You Up", with its almost jazz-funk piano solo, and the seriously funky, cookin' improvised cover of Aretha Franklin's "Rock Steady". "Yes Sir, Brother" has a real feel of William Bell & Judy Clay's "Private Number" in places. Either way, it is vibrant and catchy. Her slowed-down cover of Stevie Wonder's "Signed, Sealed, Delivered" is sumptuous. "I've Got To Go On Without You" is Stax soul at its very best. All the songs have been excellently remastered and the sound is top notch. Absolutely superb in fact - warm, full and bassy. There were so many great soul voices in the seventies who never really got the credit they deserved. Shirley Brown was one of those.